March 31 (gogo.mn) Mongolia has vast 173 billion tons of coal reserves. Although we are leading with the coal reserves per capita, Mongolia is the last on the list of coal production and sales. Latest technological advancements in the renewable energy is posing a threat to the coal market. It is inevitable that coal might become just the fossil in 30 or even 40 years ahead. Therefore, it is crucial for us to put the coal into economic circulation and think of the alternative products made with coal. The primary objective of Coal Mongolia event is to bring International Investors into the coal sector of Mongolia; to introduce the most advanced, environmentally friendly technologies in coal mining sector; to create a mutually beneficial partnership that will strengthen Mongolia's competitiveness in Asian region. 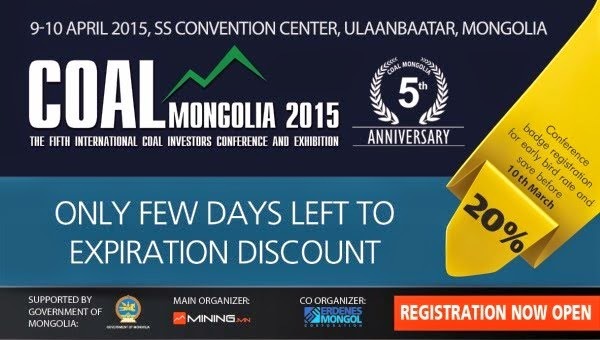 This year's "COAL MONGOLIA-2015" International Conference and Exhibition is celebrating its 5th anniversary and commemorates the 5th anniversary of the first international IPO that attracted the first investment in coal sector and is scheduled for April 9-10, 2015 with the support from the Government of Mongolia with over 600 participants of the decision making level and over 2000 participants to attend the exhibition. The conference is to be attended by the Prime Minister Ch.Saikhanbileg, Minister of Mining R.Jigjid, Minister of Energy D.Zorigt, Minister of State M.Enkhsaikhan and to address the main issues on the coal market development, directions and possible solutions to move the sector forward. Moreover, the international coal market players such as Anglo American, Peabody Energy, Sinopec, Posco and biggest financial institutions ING and BNP Paribas are to attend the event on top of the Tavan Tolgoi Consortium parties Energy Resource, Sumitomo Corp. and Shenhua Energy. This year's conference is to be focused on solutions for declining coal market. More detailed information can be accessed at www.coalmongolia.mn. Mogi: let's see if this pans out. TRQ closed +4.35% Tuesday to US$3.12. March 31 (Reuters) - Rio Tinto and Mongolia have made a breakthrough in a tax dispute that has been among issues stalling development of the $6.5 billion Oyu Tolgoi copper mine, according to an official familiar with the government's position. Disputes over costs and taxes have delayed an expansion of the mine that would extend its life beyond an estimated 15 years. "Misunderstandings and issues surrounding the tax climates have been resolved," the official told Reuters, without specifying the terms of an agreement or what other issues needed to be resolved for the next underground phase of the project to go ahead. "The parties are working towards agreeing on the commercial terms of the underground project," added the official, who asked not to be named because no announcement had been made yet. A Rio Tinto spokesman and a spokesman for Mongolia's mining ministry declined to comment. A spokesman for Rio's Turquoise Hill Resources, which owns 66 percent of the mine, also declined to comment and pointed to a statement last week that said Oyu Tolgoi was appealing a ruling by Mongolia's Tax Dispute Resolution Council to the country's Administrative Appellate Court. Last year, Rio handed Mongolia a proposed memorandum of understanding that would provide consent to move forwards with the expansion project. First, however, Rio and the government need to find consensus on issues including a $127 million tax claim against the company, that was later reduced to $30 million, and approval of a $4 billion project financing package. Rio Tinto's chief executive Sam Walsh said in an interview with Reuters on Saturday that the proposal sent to the government in November was the miner's "best and final offer" and that it did not seek "special treatment" with the agreement. Walsh added that there "are issues we're working through with the government, and I'm hopeful we'll bring to resolution." He said the firm would be willing to go to international arbitration to resolve the tax dispute, but said it was not expected to affect current phase-one production at the mine. In addition to the open-cut mine now in operation, the phase two project would see the construction of an underground mining complex. Walsh visited the mine on Sunday to mark the one million tonnes of concentrate that had been shipped since its opening in 2013. Walsh has said financing for the second phase will have to be renegotiated, especially in light of volatile copper prices. Mongolia has been concerned about costs because it cannot receive dividends for its 34 percent stake in the mine until after investors first recoup their investment. Construction on the underground complex is currently projected to cost $5.4 billion. March 31 (iNVEZZ) Shares in Rio Tinto (LON:RIO) were up 1.90 percent as of 08:02 BST after Reuters reported earlier today that the miner and the Mongolian government had resolved a tax issue which has been one of the reasons for the impasse over the development of the Oyu Tolgoi copper mine. "Misunderstandings and issues surrounding the tax climates have been resolved," Reuters said today, quoting an official in the know who had asked not to be named and who did not specify what other issues remained to be resolved. Rio Tinto and Mongolia have been at loggerheads over tax claims and the financing for the underground expansion of the Oyu Tolgoi project, which is estimated to cost $5.4 billion (£3.65 billion). Rio's subsidiary Turquoise Hill Resources holds 66 percent in Oyu Tolgoi, and the Mongolian government owns the remainder. Development costs have been a concern for Mongolia as it would only start receiving dividends once first returns were made on the investment. In December last year, Mongolian Prime Minister Saikhanbileg Chimed said his priority was to resolve a dispute with Rio Tinto over tax claims and cost overruns. Over the weekend Rio Tinto's chief executive Sam Walsh told Bloomberg in an interview that talks were "down to a few issues and these issues are deal breaker type issues […] And we are not asking for anything that is out of the ordinary or special to Rio Tinto." Walsh also said in an interview with Reuters over the weekend that Rio would be willing to seek international arbitration on the tax dispute which, however, was not expected to impact the ongoing stage-one development of the mine. The next development stage entails the construction of an underground mining complex. Rio's top executive also told Reuters the financing for the second stage would need renegotiation, especially with the current weakness in copper prices. As of 08:51 BST, Tuesday, 31 March, Rio Tinto plc share price is 2,848.25p. HALIFAX, NOVA SCOTIA--(Marketwired - March 31, 2015) - Erdene Resource Development Corp. (TSX:ERD) ("Erdene" or "Company") is pleased to announce receipt of the initial mineral resource estimate ("Mineral Resource") for Discovery Zone and Union North, two of 18 target areas identified to date at the Company's 100%-owned Altan Nar Gold-Polymetallic Project ("Altan Nar" or the "Project") in southwest Mongolia. The Mineral Resource is contained in a report produced by RungePincockMinarco Limited ("RPM") in accordance with National Instrument 43-101 ("NI 43-101") guidelines (the "Resource Report"). The Resource Report is available on SEDAR (click here for link). HONG KONG, CHINA--(Marketwired - March 30, 2015) - SouthGobi Resources Ltd. (TSX:SGQ)(HKSE:1878) ("SouthGobi" or the "Company"). The Company today announced its financial and operating results for the quarter and the year ended December 31, 2014. All figures are in U.S. Dollars unless otherwise stated. · The Company continues to operate under difficult market conditions resulting from strong seaborne and domestic supply coupled with soft demand in China. Chinese coking coal imports fell by 17.2% in 2014 and 12.6% in the fourth quarter of 2014 compared to the same periods last year. Coal prices in China stabilized in the fourth quarter of 2014, mainly due to winter restocking from end users, after hitting seven year lows in the third quarter. However, the gains made in the fourth quarter of 2014 have been erased since the beginning of 2015 due to sluggish demand, which has continued beyond the Chinese New Year holiday. The Company's sales volumes and revenues are expected to remain under pressure through 2015 as Chinese coal import volume and prices continue to decline. · Production of raw coal by the Company remained low at 0.21 million tonnes in the fourth quarter of 2014 compared to 1.73 million tonnes in the fourth quarter of 2013. This lower production level is due to the Company's decision in June, in response to market conditions, to reduce its production and place approximately half of its workforce on furlough. This furlough is anticipated to remain in place until market conditions improve. · On January 7, 2014, the Company reported the public announcement regarding the Ontario Action against certain of the Company's current and former senior officers and directors, and its former auditors, in relation to the Company's restatement of financial statements, as disclosed on November 8, 2013, November 11, 2013, November 14, 2013 and December 12, 2013. · Messrs. Lindsay Dove and Sean Hinton did not stand for re-election at the Annual General Meeting held on May 6, 2014 and ceased to be directors at that date. · On May 25, 2014, the Company announced that Turquoise Hill Resources Ltd. ("Turquoise Hill") had agreed to provide a $10 million shareholder loan facility (the "Turquoise Hill Loan Facility"). · On June 20, 2014, the Company announced that the exemption granted to the Company in relation to its secondary listing status on the HKEX in 2010 by the Hong Kong Securities and Futures Commission pertaining to Takeovers, Mergers and Share Repurchases (the "Takeovers Code") had been withdrawn and that the Company would be considered a public company in Hong Kong for matters relating to the Takeovers Code. · On July 30, 2014, the Company reported that Turquoise Hill had entered into a share purchase agreement ("SPA") with National Resources Holdings Limited ("NUR") to sell Common Shares representing 29.95% of the Company's total issued and outstanding Common Shares. · On August 26, 2014, the Court of Justice in Mongolia returned the tax investigation case against the Company's subsidiary SouthGobi Sands LLC ("SGS") and three of its former employees to the Prosecutor General for further investigations. · On August 31, 2014, the Company announced that Turquoise Hill had agreed to a limited deferral of repayment of all funds owing and due by the Company under the Turquoise Hill Loan Facility. · On September 28, 2014, the Company announced the completion of the construction of a paved coal highway to the Shivee Khuren Border Crossing. · On November 12, 2014, the Company announced the December 1, 2014, retirement of Ms. Kay Priestly as Chair, the appointment of current independent director Mr. Gordon Lancaster to the position of interim Chair and the appointment of Mr. Jeffery Tygesen as a non-executive director. · On November 20, 2014, the Company announced that it was delaying the payment of the November 2014 installment of cash interest due to the China Investment Corporation ("CIC") under the terms of the Convertible Debenture (the "November CIC Payment"). · On December 1, 2014, the Company announced that it had entered into private placement and CIC had agreed to extend the cure period agreed for the November CIC Payment to December 4, 2014. · On December 2, 2014, NUR signed an amendment agreement ("Amendment Agreement") to the previously announced and signed Sale and Purchase agreement dated July 29, 2014 with Turquoise Hill in respect of the sale of 56,102,000 Common Shares of the Company held by Turquoise Hill. In respect of the transaction contemplate, the Amendment Agreement provides, among other matters, for an extension to the closing date from November 30, 2014 to April 30, 2015. · On December 3, 2014, the Company successfully completed private placements for the issue of 24,360,773 Common Shares for gross proceeds of US$9.0 million (US$8.9 million net after fees) at CAD $0.42 per share. · On December 4, 2014 Turquoise Hill agreed on a limited deferral of repayment on the $3.8 million principal owing under the Turquoise Hill Loan Facility. The Turquoise Hill Loan Facility matured on August 30, 2014 and is no longer available for further drawdowns by the Company. This limited deferral is subject to certain conditions and limitations, including the completion by April 30, 2015 of the transaction contemplated by the Sale and Purchase Agreement and the Amendment Agreement between Turquoise Hill and NUR. · On December 12, 2014 the Company announced the stepping down of the President and Chief Executive Officer Ross Tromans, and appointment of Enkh-Amgalan Sengee as President and Chief Executive Officer. Mr. Tromans remained with the Company and on the Board of Directors (the "Board") until December 31, 2014. · On December 30, 2014 the Company was notified that the Capital City Prosecutor (head of the Capital Prosecutor's Office, Ulaanbaatar, Mongolia) had decided to dismiss the allegations for money laundering against the Company's three former employees. This was consistent with the report issued by the experts appointed by the State Investigations Agency ("SIA") on June 30, 2013 and again in January 2014. · On February 24, 2015 the Company announced it had entered into a private placement for proceeds of up to US$7.5 million with Novel Sunrise Investments Limited ("Novel Sunrise") as a proposed new significant investor and strategic partner. The completion of the private placement and related transactions was subject to acceptance of notice of the placement by the Toronto Stock Exchange ("TSX") pursuant to the financial hardship provisions of the TSX Company Manual. As a result of relying on the financial hardship provisions, the Company was placed on remedial delisting review as of February 25, 2015. A meeting of the TSX Continued Listing Committee to consider this matter has been scheduled for May 19, 2015. · On February 24, 2015 the Company was advised by Turquoise Hill that they had entered into a Sale and Purchase Agreement ("Novel SPA") with Novel Sunrise for the purchase of 48,705,155 Common Shares currently held by Turquoise Hill. The closing of the Novel SPA is subject to certain terms and closing conditions. · On March 3, 2015 following the successful closing of the first tranche of the Novel Sunrise private placement, including the receipt of US$3.5 million, the Company issued 10,131,113 Mandatory Convertible Units to Novel Sunrise and in accordance with the terms of the agreement Mr. Ted Chan was appointed as the Executive Director of the Company. · On March 13, 2015, Mr. Enkh-Amgalan Sengee, tendered his resignation as President and Chief Executive Officer. Mr. Ted Chan, assumed the duties formerly handled by Mr. Sengee until further notice. · On March 18, 2015, the Company announced that Mr. Jeffery Tygesen resigned as a non-executive director. · As at the date hereof, the Company, together with the new strategic partner, Novel Sunrise, has developed a funding plan in order to pay the interest due under the CIC Convertible Debenture, meet the Company's obligations as they fall due and achieve its business objectives in 2015 and beyond. However, there is no guarantee that the Company will be able to implement this funding plan or secure other sources of financing. See section "Liquidity and Capital Resources" for details. As at March 30, 2015, the Company had cash of $4.2 million. VANCOUVER, BRITISH COLUMBIA--(Marketwired - March 30, 2015) - Entrée Gold Inc. (TSX:ETG)(NYSE MKT:EGI)(FRANKFURT:EKA) ("Entrée" or the "Company") has today filed its annual operational and financial results for the year ended December 31, 2014. "In 2014, Entrée initiated an infill drilling, pre-feasibility level program at our Ann Mason project in Nevada, to upgrade the current NI 43-101 Inferred and Indicated resource to Measured and Indicated categories. Measured and Indicated resources will form the basis for estimating reserves as the project advances farther along the development timeline and provide a greater degree of confidence to the within-pit mineralization," said Greg Crowe, President and CEO of Entrée. "To further de-risk the project, additional metallurgical studies have been initiated, to confirm previous work, which indicated that the Ann Mason deposit has recoveries greater than 90% and produces a high quality, 30% copper concentrate, with no penalty elements." "Concurrently, we have continued to engage in discussions with the Government of Mongolia, Turquoise Hill, Rio Tinto and Oyu Tolgoi LLC with regards to our assets in Mongolia. While no final agreements have been reached, we remain optimistic that a resolution of all outstanding issues surrounding Oyu Tolgoi is possible." "We continue to manage our operational and growth opportunities while still maintaining a prudent cash management strategy. We marked the end of 2014 with over US$33,000,000 in our treasury allowing us flexibility in our business model to adapt to changing market conditions and act on potential opportunities." BAAR, SWITZERLAND / TheNewswire / March 31 2015 - MNP Petroleum Corp. ("MNP") (TSX-V: MNP; OTCQB: MNAP) has filed its annual report on Form 10-K for the year ended December 31, 2014 on EDGAR and on SEDAR. The report is available on the MNP website at www.mnppetroleum.com and at www.sedar.com or www.sec.gov. The Form 51-101 F1 is available on www.sedar.com. Toronto, Ontario (FSCwire) - Mongolia Growth Group Ltd. (YAK – TSXV and MNGGF – USA), ("MGG") or ("the Company") a commercial real estate investment and development company participating in the dynamic growth of the Mongolian economy announces the release of its February 2015 Shareholder Letter. In February 2015, MGG's core commercial property portfolio* experienced a same-store rental increase of 12.2% relative to February 2014 on properties owned 12 months or longer, as measured in local currency (Mongolian Togrog). Total billed revenue for February 2015 was 280.2 million Mongolian Togrog, as compared to 242.7 million Mongolian Togrog in February of 2014 or a 15.4% increase. ** The occupancy rate for the core portfolio in February of 2015 was 93.8% including an occupancy rate of 100.0% for core retail properties and an occupancy rate of 95.3% for core office properties***. We have continued to increase the size of our Tuguldur Center footprint through acquisitions of adjacent buildings. Most recently, we acquired a 77 square meter building that will serve as the western extent of our Tuguldur Center. Our goal is to renovate this building during the summer, in order to adjoin it physically to Tuguldur, increase its size to approximately 100 meters of usable space along with adjusting its facade to match that of Tuguldur's. To date, we have received numerous offers to rent the building once renovations are completed. The acquisition was funded primarily through the swapping of two assets that we were marketing for sale. We believe that the completion of Tuguldur Stage 2 will dramatically transform MGG's revenues and cash flow going forward. Over the past month, we have opened dialogue with multiple lenders about securing debt funding for the development of Tuguldur Stage 2. In order to be in a position to proceed with the development of this project as soon as funding is secured, we have signed an enabling works contract in order to relocate underground utilities running through the site upon which Stage 2 will be built. Starting these works early will put us in a position to rapidly progress the project as soon as Stage 2 construction funding is available. · The Cabinet decided to finance Egiin River Hydro-electric Station by a soft loan from China and start negotiations on it. Project Feasibility Study was approved in August 2014 and the total project needs USD 827 million. PM's Spokesman told press today that USD 827 million will be financed from USD 1 billion soft loan from Chinese Government. March 30 -- Central Asia Metals plc (AIM: CAML), a copper producing company, today announces its full year results for the 12 months ended 31 December 2014. The Company proposes a 7.5 pence final* dividend bringing 2014 full year dividend to 12.5 pence (5 pence interim dividend paid in October 2014 and 7.5 pence final* dividend is a 50% increase on this interim dividend). Losses from discontinued operations reduced to $0.3 million (2013: $14.1 million) following the full write down of all the Mongolian assets during 2013. Previously reported segments within the Group, namely all the Mongolian operations, are classified as held for sale as at 31 December 2014. In June 2014, Bayanresources LLC, a Mongolian incorporated company owned 70% by the Group was sold for nil consideration. As at 31 December 2014, $206,000 of intercompany loans and management fee receivable with the Mongolian subsidiaries had been written off during the 12 month period as part of the Group impairment testing (2013: $13,691,176). March 27 (AAStocks) WINSWAY (01733.HK) announced that its revenue for 2014 declined 43.3% yearly to $7.55 billion. Loss widened from $1.79 billion in the year-ago period to $3.70 billion. LPS was 98 cents. No final dividend was declared. March 29 (AAStocks) WINSWAY (01733.HK) was notified by Mr. Wang Xingchun, the chairman and the company's controlling shareholder that he pledged 320 million shares in the company in favour of an independent third party of the company as security for the performance of certain contractual obligation of Beijing Winsway Investment. Ulaanbaatar, March 30 /MONTSAME/ At the Stock Exchange trades on Monday, a total of 5,796 units of 17 JSCs were traded costing MNT 14 million 867 thousand and 585.00. "State Department Store" /1,977 units/, "Tavantolgoi" /1,110 units/, "Hermes center" /1,000 units/, "Khovsgol geology" /700 units/ and "Talkh chikher" /355 units/ were the most actively traded in terms of trading volume, in terms of trading value were "Talkh chikher" (MNT six million 354 thousand and 500),"Tavantolgoi" (MNTfour million and 190 thousand), "State Department Store" (MNT one million 028 thousand and 040), "Gobi" (MNT 825 thousand and 370) and "APU" (MNT 462 thousand and 100). The total market capitalization was set at MNT one trillion 316 billion 879 million 497 thousand and 464. The Index of Top-20 JSCs was 13,213.66, increasing 0.41% and the all index of MSE was 962.64, increasing 0.24% against the previous day. 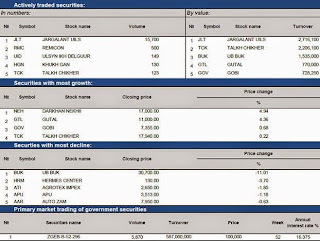 March 31 (MSE) On 31 March 2015, 52 weeks Government retail bonds worth MNT587,000,000.00 with 16.375% annual interest rate traded successfully on primary market at Mongolian Stock Exchange. March 31 (MSE) According to the resolution No. :156 of FRC, dated 23 March 2015, "Golomt Securities" LLC granted an underwriting license. Therefore, "Golomt Securities" LLC has got a right to operate in three areas as Brokerage, Investment Advisor and Underwriting activities. Click here to view more information about "Golomt Securities" LLC. 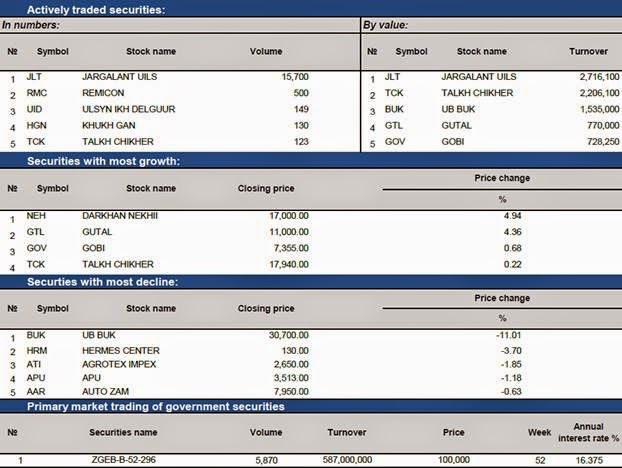 March 30 (MSE) On the block trading of 27 March 2015, shares of "Mongol Makh Expo" JSC and "Bishrelt Industrial" JSC were traded with price more than 50% devaluation compared to their last closing prices respectively. 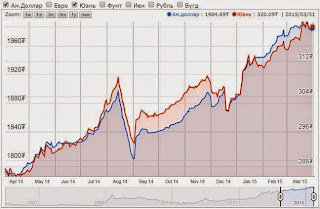 Mongolian stock exchange considered these two block trading as a suspicious transactions and started relevant inspections. March 30 (Bloomberg) -- Foreign direct investment in Feb. into Mongolia was $10.2m, according to preliminary data released by central bank today. March 31 (Bank of Mongolia) On the Foreign Exchange Auction held on March 31st, 2015 the BOM has received bid offers of USD 21.6 million in a rate between MNT 1980.0-1986.12 and CNY 89.0 million in a rate of MNT 319.16-319.96 from local commercial banks. BOM has sold USD 7.5 million in a rate of 1984.61 and CNY 42.0 million with rate of 319.69. On March 31st, 2015, The BOM has received MNT Swap agreement bid offer in equivalent to USD 1.5 and USD Swap agreement bid offer of USD 191.5 million from local commercial banks and accepted the offer. March 31 (gogo.mn) Bank of Mongolia Governor N.Zoljargal issued order regarding the "General Provisions of Service Fee for Bank of Mongolia". The order was issued on March 25th and some media outlets have misleading information that ATM fees to be reduced. We have clarified on this matter from Yu.Gereltuya, Head of the Media Relations Department of Bank of Mongolia. According to Yu.Gereltuya there are differences in the Bank of Mongolia regulations and commercial banks regulations related to the service fees. General Provisions of Service Fee for Bank of Mongolia, which is the regulative document for the services to be received by the Bank of Mongolia, State Fund of Ministry of Finance from other participating commercial banks. As per the international standards, Bank of Mongolia is serviced by the commercial banks as well. -Which entity sets and regulates the ATM fees operated by the commercial banks? -According to the provision 11.3 of the Bank Law commercial banks are to set their service fees, therefore service fees for the public is regulated by commercial banks internal rules and regulations. Also she emphasized the need to differentiate between the service fees for Bank of Mongolia and services offered to commercial customers. March 30 (gogo.mn) Mongolia's economy has been declining almost consecutively for 20 years. Despite the unique names they select for themselves, the governments we have had so far have failed to reduce currency depreciation, unemployment, and poverty. Although Mongolians attempted to accumulate money and wealth, our real income has not seen any increase because savings rate in commercial banks is always caught up by inflation rate. On top of that, tugrug rate fell twice as much as the inflation rate in 2014 and has recently been so weakened that the tugrug rate against USD reached 2,000. The authorities tell us that the lack of circulation in economy derives from shooing the foreign investment away and the falling prices of coal, copper, and gold. Even though this argument is valid for Mongolia's economy, which is dependent solely on mining, we are not talking about what is truly causing the economic decline. The primary cause is the government's deep-seated habit of controlling prices, which is the elephant in the room that we have been ignoring. In any country, price of consumer goods and change in prices reflect reliability of its economy. People conceal their wealth if they live in a country where the risk of losing your property or getting robbed is high. But, one should be able to increase his wealth only when he puts it into circulation, which would result in mutually beneficial commercial interactions. Therefore, we can see whether this system is corrupt or not by looking at how prices are being set and by whom. Prices that are set by supply and demand in a fair way that is exempt from any external control are used as market indicators by investors, consumers, and others to make commercial decisions. These indicators, only when they are accurate, show you where surpluses and shortages are in the market. The government has been setting prices of many consumer products in Mongolia. Under the name of caring the people and supporting businesses, the government has been setting and restricting prices. In the end, such measures benefit the decision makers the most and allow them to steal from public funds. Mongolia is seeing a growing number of populists who have a hidden agenda to serve their individual interests by controlling prices of consumer products, but claim that they will protect the people from the rich. It can be seen from the example of Mongolia's agriculture sector. Who wins? Crop farmers, flour makers, or consumers? Mongolian crop farmers have broken a 20-year record by gathering a harvest of 489,000 tonnes in 2014. Nevertheless, crop farmers today are opposing wheat imports from Russia. On the other hand, flour makers are stressing the need to buy from abroad because the gluten content of Mongolia's wheat is below 28 percent. Crop farmers were provided with a subsidy of 100,000 MNT per one tonne of wheat in the past whereas it has been reduced to 70,000 MNT this year due to the economic decline. They started providing the subsidies in February this year. It means that 1.4 billion MNT is given for harvesting 20,000 tonnes. But, the flour makers paid the same amount (1.4 billion MNT) to the government for customs taxes and VAT when importing 20,000 tonnes of wheat. The subsidies come from the public budget as spending whereas the taxes are added to the budget as revenue. So, which one is more profitable? The government cannot ruin an industry by supporting another. As soon as the harvest is over, flour makers go to the crop farmers and buy their wheat that has most gluten content. When a new year comes and the gluten-low wheat is not purchased, the crop farmers, flour makers, and the government have an argument every year over whether it is needed to import wheat or not. The government decisions keep getting stuck amidst lobbying, which results in a shortage of flour. Consequently, the flour makers are forced to get low quality wheat. It is said that there are three ways to produce flour using wheat of such low quality. One way is to import better quality wheat from abroad and mix it before working the mill. Another way is to mix the flour with that coming from Russia to increase the quality. The third way is to bring chemicals from China to 'fix' the gluten and color of the wheat, after which the flour is delivered to consumers directly. If the value chain of flour is thoroughly examined, it can be seen that all deficits are made up by money coming from taxpayers and consumers rather than crop farmers and flour makers. In return, the taxpayers and consumers get flour with mixed chemical that could harm your health. False prices allow corruption to grow. When that happens, there is a need to control prices at a larger extent. Every market player who has been receiving any kind of subsidies demands that it continues. As a result, every one of them has political decisions favoring them. As a consequence, the prices become more deviated. As prices get false, the authorities who set prices have stronger interest to conceal it more and distort information. Such distortion benefits the authorities and their conspiring associates only. If prices are freed to be set accurately by supply and demand, it will allow economy development including creation of more jobs. In order to overcome the economic decline, Mongolia needs a free price system exempt from any obscurity. March 31 (GoGo Mongolia) Cabinet plenary session held yesterday has issued a detailed plan to implement the program to overcome economic downturn. Initially the plan submitted jointly by the Ministry of Finance, Bank of Mongolia and Financial Regulatory Commission had 592 items and the cabinet session have come up with 220 items after the discussions and comprised into the detailed plan. The government program is directed at the ensuring the budget sustainability, stabilization of the currency rates, increasing the gold mining and employment rates according to Ts.Munkhtur, PR and Media Advisor to PM. Ulaanbaatar, March 31 (MONTSAME) The Minister of Finance J.Bat-Erdene presented to the cabinet on Monday a course of a project on developing incentive system of value added tax (VAT). An obligation was given to a head of the General Taxation Office (GTO) to accept actions of the incentive system of VAT within a time, reflected in the project's general plan, and to put it into use. By the governmental resolution, the project's unit has been set up to develop the VAT incentive system at the GTO. This system allows all citizens and enterprises who pay VAT to attend incentive lotteries and to get incentive money when they make purchase with cash. Ulaanbaatar, March 31 (MONTSAME) The cabinet meeting on Monday discussed a draft amendment to the general law on taxation in order to refine the law's clauses on fines and penalty, and obliged the Minister of Finance to approve the draft's concept and to submit it to parliament. If this amendment is approved, the fine pressure will be abolished for those taxpayers who do not pay taxes in due time but have correct tax reports, the penalty over tax payment violation will serve without any duplications, and the payment terms will become understandable, as the clauses on fines and penalty within the law on VAT will be passed to clauses of the law on responsibilities of the General Taxation Office (GTO). Ulaanbaatar, March 31 (MONTSAME) On March 30, the cabinet discussed the draft new wording of the law on implementing court decisions and resolved to submit it to parliament, with a reflection of Ministers' suggestions. In the draft, the articles will not be amended regarding the implementation of the court decisions on civil cases, a regulation will be added to them about the decisions on administrative cases, moreover, a way of realizing decisions on criminal cases will be completely renovated being coordinated with the draft new wordings of the Criminal Law and the Law on Criminal Investigation. If adopted, the law is bound to help in establishing a legal environment where the criminal responsibilities are unavoidable and the law implementations are efficient, and in reducing impact on individuals due to having served sentences. March 31 (gogo.mn) D.Nanzandorj, Head of the State Property Committee has submitted letter of resignation. The request has been discussed by the cabinet plenary session yesterday and the cabinet approved the resignation. New Head of the State Property Committee is to be appointed through the selective process. March 31 (infomongolia.com) The regular Cabinet meeting of the Government of Mongolia took place on March 30, 2015, where the following issues were resolved. - The Invest Mongolia Agency is authorized to establish a concessional agreement with "National Trading and Transport Group" LLC on Project to construct "State Reserve Storage in Rashaant". Accordingly, the Minister of Industry D.Erdenebat is administered to organize contract signing issues under relevant laws and regulations. - The National Committee's Regulation on Youth Development Issue was ratified chaired by its Chairman, Minister of Population Development and Social Protection S.Erdene. - Minister of Construction and Urban Development D.Tsogtbaatar is entrusted to monitor on implementation of "New Development", a medium-term target program to construct the "Shine Yarmag" residential area with a total fund of up to 50 million USD. The project finance will be carried out by State Property Committee and Development Bank of Mongolia via State Housing Corporation. - Finance Minister J.Erdenebat and Minister of Education, Culture and Science L.Gantumur are authorized to allocate a fund to construct a kindergarten for 120 kids in Erdenebulgan Sum of Arkhangai Aimag. The fund is a part of 300 million CHY grant aid provided by the Government of China to renew and construct 21 objects throughout the country. - A comprehensive program on measures to overcome economic and financial difficulties was ratified considering over 592 proposals and initiations forwarded from Ministries, Agencies, Central Bank of Mongolia, Financial Regulatory Commission, Economic Council under Prime Minister, as well as NGOs and professional experts. March 31 (news.mn) The Agency for Fair Competition and Consumer Protection is carrying out studies in the airplane fuel market. The Head of the agency, T.Ayursaikhan, held a meeting with the directors of the following companies: MIAT, AeroMongolia, Tengerin Ulaach, Tomas Air, Geosan, and Blue Sky LLC. During the meeting, T.Ayursaikhan told the representatives of the air transportation companies, "Our organization is carrying out an inspection of the airplane fuel market. As you know, airplane fuel supply companies have decreased their prices for fuel. And they have said they can decrease prices further. "We are aiming to maintain national companies and create favorable market conditions for them. From your side, please put attention on the creation of favorable conditions, not only for services provided to your customers, but also in regard to prices." One of the airline company representatives noted, "Fuel occupies 30 to 40 percent of our total expenses. We are asking to establish fair competition in the airplane fuel market and stop the monopoly of these companies. "In the case that favorable conditions are created in the airplane fuel market, it will also be possible to decrease prices for passenger transportation." Mongolia meets its fuel consumption entirely from imports, and in 2013 a total of 58,600 tons of petroleum were imported, and 45,000 tons of airplane fuel in 2014. Of the imported petroleum 78.6 percent was from Russia, 12.7 percent from Belarus, and 8.4 percent from Lithuania. Sodmongol Group LLC is importing 80 percent of airplane fuel in Mongolia, and Mergenvan LLC carries out the sales and refueling of airplanes. Reportedly due to the high prices of petroleum, MIAT has been working at a loss and Eznis Airways has filed for bankruptcy. March 30 (news.mn) According to the law, the spring session of Parliament is to begin on April 5 each year, but this year the date falls on a Sunday, so it has been decided that the session will open on Monday, April 6. In spring and autumn of each year civil movements call for the ousting of the Parliament, however, this year, parties without seats in Parliament are calling for the ousting of the government. Some believe that the smaller political parties have begun their call because election season is close, and many critics feel that the Parliament has become morally bankrupt. Sessions never start on time, even though MPs initiated a law to fine MPs who delay sessions with a 100 000 MNT penalty. There have also been reports that some MPs take their seats in the parliamentary hall while inebriated. Dissatisfied voters believe MPs should discuss development policy instead of arguing with each other. For many, this is the current image of the Parliament. Pundits say that now is the time to correct mistakes, make up for lost days, and work hard, because a great number of laws are to be discussed during the spring session such, as the General Election Law, Law on Political Parties, Law on Financing of Political Parties, and drafts to make amendments to the Constitution of Mongolia. Parties holding seats in Parliament have expressed interested in moving the General Election Law forward. Ulaanbaatar, March 30 (MONTSAME) The Deputy Prime Minister U.Khurelsukh met Monday with the State Secretary of the Ministry of Road and Transport, Erdenes Mongol state-owned company's authorities, the chairman of the General Authority for Specialized inspection, and other officials, and obligated them to stop the dirt road transport of coal in the Gobi. Mr Khurelsukh worked in the Gobi regions on March 25-28 and saw for himself the unsolved problem of the coal transport. The locals told him that trucks carrying over 100 tons loads go by dirt roads and destroy a fragile soil of the Gobi. Energy Resource LLC has built a paved road connecting the deposits to Gashuunsukhait checkpoint, on the border with China, but the dirt road transport still continues due to relatively higher charge of road payment. The Deputy PM instructed the gathered to decrease the payment per ton to one US dollar and to prohibit the dirt road transport, giving the officials one week. "You must settle this problem concerning the nature and the people within the given time, otherwise I will impose responsibilities upon you," said Mr Khurelsukh. Ulaanbaatar, March 31 (MONTSAME) Erdenet Mining Corporation (EMC) authorities made the 2014 open reporting on March 27 at the Cultural Palace of Miners in Erdenet city. This was EMC's second open reporting, since it had shifted to a transparent reporting system last year. In 2014, EMC processed 126 thousand tonnes of ore, shipped 4,521 tonnes of copper concentrate and 632 tonnes of molybdenum concentrate, said a group of division heads and staff representatives led by the Director-General Ts.Davaatseren. Maintenance and mechanics factory satisfied its plan with 100 percent, and occupied 40 ranges of casts weighing 230 tonnes. This factory alone produces 80 percent of all technologies and equipment used in the operations of the plant, so the plant director has banned an import of the similar hi tech. The factory produced a total of 31 kinds of 144 import-substituting products last year, according to the report. The above factory will also develop as the major heavy industry of EMC to produce mining equipment, when the mine will close in 30 years. In 2014, EMC conducted mine drilling with a total depth of 39 thousand meters, breaking the record in the industrial history of Mongolia, says the report. March 30 (gogo.mn) Oyutolgoi LLC (OT) and Erdenet Mining Corp. are expected to sign a memorandum of cooperation at the end of April. Owners of the biggest copper mines in Mongolia are to cooperate in three directions. First, equipments that produced by Maintenance and Mechanic Factory of Erdenet Mining Corp., will be supplied to OT. In other words, "Erdenet" Mining Corp. will produce equipments by the order of OT. Second, staff who is necessary to OT is to be prepared by University of Science and Technology at the Erdenet Mining Corp.
Recreation at Erdenet Mining Corp. provides with professional nursing and medical treatment for occupational diseases. Thus, OT staff working in difficult conditions are to be treated in accordance with the health insurance at the Erdenet Recreation Facility. General Director of the Erdenet Mining Corp, Ts.Davaatseren said: "OT is modern mining company. They use new and innovate technology. They are experienced in occupational and labour safety. Therefore, we have many things to learn from them. Even, we are competitors on market, we have more opportunities to cooperate than competing." Head of Maintenance and Mechanical Factory at Erdenet Mining Corp, D.Munkhsaikhan said: "We have 640 employees. We have been cooperating with OT since last year. We have produced three types of order by OT, including cast armor. We produce 5,000 tons of cast, 2,000 tons of processed parts, 80 tons of rubber products and 800 tons of metal casting per year. Last year, we produced 144 import-substituting products domestically and saved 3.7 billion. We supplied parts to total of 46 enterprises and individuals. According to rapid development of mining in Mongolia, Maintenance and Mechanical Factory will become the main supplier of spare parts to those mining companies in the future. In addition, we will produce reinforcement construction and rebar.Third, we aimed to diversify the types of cast parts and increase the annual production of rubber parts to 250 tons. We earned one mungu profit from one tugrug product." Thus, two biggest copper mining companies of Mongolia started cooperation. Oyu Tolgoi LLC vs. Erdenet Mining Corp.
March 31 (gogo.mn) Erdenet Mining Corp. is the Mongolian and Russian joint venture to hold copper and molybdenum mining and production of copper and molybdenum concentrates and is counted as one of the biggest manufactures in Asian region. The corporation held its annual report last Friday in Erdenet city. We are delivering the numbers of Erdenet Mining Corp. in comparison with Oyu Tolgoi LLC. Although those entities have differences in their operation period and investment agreement, those two are considered as biggest projects from Mongolia. March 30 (gogo.mn) Mongolian Erdenet Mining Corp. employs 5,841 employees in total out of which 300 are Russian citizens. The average salary for this corporation is MNT 2.1 million. The corporations have issued MNT 2.6 billion in support for the 1,382 elder employees last year. Out of which MNT 27,7 million was granted to 141 elders. Erdenet Mining Corp. allows its employees to enjoy three year maternity leave. Last year the corporation issued the subsidies for 110 mothers worth of MNT 467 million. Also the management helps its employees with grant equal to MNT 8 million to form the 30 percent deposit for mortgage loan program. Total of 992 employees have successfully enrolled into housing mortgage loans. Those subsidies are available for the employees, who worked for three and more years. March 30 (UB Post) Lately, rumors have been spreading among the public about the possibility of stopping the housing loans with eight percent interest rate. Executive Director of Mongolian Mortgage Corporation LLC (MMC) D.Gantugs was interviewed for clarification on this matter. The Housing Mortgage Program, which issues the eight percent interest housing loan, has been active for some time. How has the program impacted society and economy? The Housing Mortgage Program, implemented by the government and Mongol Bank since June 2013, has contributed significantly for supplying housing needs of Mongolia. The program has continued for 20 months and commercial banks have newly issued eight percent interest housing loan or reduced interest rates of previously granted housing loans of 48,400 households in total. Mongol Bank has released transparent reports on this every month. The total outstanding mortgage debt had reached 2.24 trillion MNT, according to the February 2015 report. The program was able to provide a big incentive for residents taking out mortgage loans nationwide. Also, an increasing number of people are becoming interested in buying apartments with medium and long-term loans, so the program has been able to actively support employment of these individuals. A study showed that over 100,000 people work at commercial, industrial and service sectors that are closely related to the construction sector. Launching the mortgage program has protected their stability of employment, and employer organizations received support for preventing potential financial risks caused by slow economic growth. What's the role of MMC in this program? Our company is responsible for the issuance of asset-backed securities (ABS). At the end of February 2015, we issued four mortgage-backed bonds, each worth 1.3 trillion MNT, to 36,000 households. The majority of people granted with the eight percent interest loan are people aged up to 45. It's important to highlight that compared to practices of other developing countries, Mongolia's stock market isn't capable of developing its urbanization and housing markets by issuing asset-backed and long-term securities due to inadequate legal environment and economic resources. Uncertainty about the continuation of the eight percent interest housing loan program is growing among the public because of lack of information regarding the purpose of bond issuance and financial resources, reliability and perception of risk of bond issuance in the markets. I believe one of MMC's major tasks is to eliminate this lack of information, provide more specific and credible promotions and advertisement, and increase public awareness about ABS. Our company is cooperating with professional organizations in providing necessary information to legal structures and investors regularly to improve the ABS market. Banks' lending criteria is being raised and residents are complaining about it. Why are lending criteria being raised? High lending criteria is not only connected to the housing loan but also directly connected to requirements and conditions for granting good quality loans with low risks. Our company didn't set new restrictions, regulations or procedures for issuing the eight percent interest loan when the program was launched. There are three main types of regulations that must be followed by everyone when initially determining these lending criteria. Firstly, requirements in the Regulation on Mortgage Loan Operation approved in 2008, the Regulation on Mortgage Financing approved in June 2013, and the Price Stabilization Program approved through the government resolution have to be consistent. The second set of regulations to follow includes the Laws on Asset-backed Securities Market, Registration, Evaluation, Cash Deposits, Payments and Lending Operations, as well as requirements in Civil, Insurance and Mortgage Laws. Our company is making timely settlement of securities issued by banks under the Housing Mortgage Loan and providing normal and smooth payments to holders of securities. In 2014, we made a total of 84 billion MNT worth of transactions, and these payments are being used again as another source for the eight percent interest housing loan. MMC is planning to continue ABS, upgrade the program, and execute transactions two times more than those made in 2014. How many people from rural settlements are applying for housing mortgage loans? At the start of February 2015, ABS worth over 1.32 trillion MNT was issued to a total of 31,000 households. Around 32.5 percent of these households were residents from rural settlements. If we account it with the amount of credit, 25.8 percent of the total mortgage loans were granted to rural areas. Lately, construction work of residential buildings in rural areas is expanding rapidly nationwide and the outlook for meeting housing demands of provinces and soums is looking positive. A regulation to include eight percent interest loans for apartments in rural areas has been passed. How is this work processing? Have people in rural areas applied for it? Last year in May, the government made amendments in related regulations. Some infrastructure works, implemented at province centers since November 2014, are now ready for commissioning. The regulation of MMC was amended to include apartments in rural areas, which meet criteria set by Mongol Bank and have adequate solutions for heating and water supply infrastructure, in the housing loan program with eight percent interest rate. It's been determined that evaluations for buildings in rural areas that are being purchased by residents with eight percent interest loans will be executed by professional organizations and the organizations have to report to banks on whether the buildings meet lending criteria. In addition, land ownership of apartments must be certified and be valid for up to 20 years. The MMC securitizes lending portfolio received from banks and puts it up for the second market. The majority of residents aren't aware or don't understand what securitizing is. Can you clarity the term? MMC was established in 2006 to develop the secondary market for housing investment through securitizing. Since then, our company repeatedly conducted studies and began implementation in 2009. By the end of 2009, we provided securities for a total of over six billion MNT, traded with banks, and bought housing mortgage in package with the revenue secured from banks. We paid securities charges before its deadline in 2013, and closed charges of securities owned by investors. Our company supervises and buys loans issued to residents from banks and financial organization, as well as financial receivables, and attracts sources from investors by guaranteeing financial assets and issuing bonds. Afterwards, these receivables are actively administrated into the stock market turnover. This process can be understood as securitizing. This process isn't only executed between MMC and banks but is also dependent on the specifics of transactions, asset type and nature of the securities, as well as related conditions. The Financial Regulatory Committee must be notified and approval of the committee is required. Currently, how many securitizations have been made? The first ABS, a mortgage-backed bond, was issued in December 2013. Since then, we received four approvals from the Financial Regulatory Committee and issued securities worth over 1.32 trillion MNT to date. Will the eight percent interest housing loan continue sustainably? Even if the government has changed, what conditions are required for continuing the loan without interruptions? It's possible to continue issuing the loan. This issue was raised when the program was first executed. The securities charges, which I mentioned before, are later used for supplying housing needs. Increase in revenue and savings of people after the economic growth are the main factors for finding financial sources for banks. The stock market will see sustainable growth in the future in relation to adoption of many important laws such as the Securities Market Law and Investment Fund Law in 2013. One of the fundamental impetuses for sustainable stock market growth is macro-economic stability and its balanced growth prospects. March 30 (UB Post) Mayor of Dornod Province S.Ganbat was dismissed last week, following the province representative council's demand approved by Prime Minister Ch.Saikhanbileg. The council submitted the demand to the Prime Minister ten days ago, with three allegations posed against Mayor S.Ganbat. They opposed the Mayor's recruitment of incompetent employees in an abuse of his authority, the privatization of state-owned property, and as previously reported in the UB Post, they believe he illegally spent the Environmental Fund of the province for his own profit. The Prime Minister received a similar request calling for the dismissal of the Dornogovi Province Mayor from the province's representative council, but refused to consider the provincial officials request in the future due to concerns about political agendas which arise shortly before elections. Ch.Saikhanbileg highlighted, "We shouldn't be talking about the dismissal of officials when livestock birth and nationwide spring sowing are approaching soon and there are development projects that we need to resume. I will not process any dismissal request from provinces." March 31 (gogo.mn) Changes have been approved in the regulations of the state subsidies to the herders to supply sheep wool and camel wool to the national manufactures. State subsidies for the wool is to be based on the quality of the wool in order to increase the breeding of the sheep with output of narrow and middle fiber wool to increase the overall wool production. In this regard, MNT 2000 subsidy is to be issued per kg of the narrow and middle fiber sheep wool, while the wide fiber sheep wool submitted to the domestic manufactures will be subsidized with MNT 1000 per kg, except of sheep bred in Tuv, Selenge, Darkhan-Uul, Bulgan and Khentii aimags. The subsidy for camel wool is set at MNT 1000 per kg. Government believes that this differentiation for the subsidies will drive the increase of quality of wool, which in turn will impact on the end user product and result in high exports output. March 27 (Oxford Business Group) Despite abundant energy resources, Mongolia is struggling to meet its growing demand for electricity, increasingly relying on imports until long-term projects to develop new generation capacity are completed. Energy production rose by 6.7% last year, with a total of 5.5bn KWh being generated domestically, according to data issued by the Ministry of Energy at the end of February. The increase was secured by new capacity brought on line at existing plants, but production still fell short of demand for power. Total electricity requirements rose to 6.9bn KWh last year, with the deficit made up by imports from China, which accounted for nearly 1bn KWh, and Russia, which provided a further 0.4bn KWh. The rapid rate of expansion of the Mongolian economy – led by a boom in mining and manufacturing − combined with a long lead time in rolling out energy projects, has led to an electricity shortfall since 2009. Installed capacity is currently just under 1100 MW, of which only about 800 MW is available. With most of the existing plants and transmission systems built in the 1960s to 1980s, the facilities are prone to shutdowns and long periods of maintenance, worsening the supply shortage. Most of Mongolia's installed generational capacity is thermal, utilising an abundant and cheap supply of coal deposits to fire power stations' turbines. Last year, 76.5% of power consumed and well over 90% of electricity generated locally came from thermal plants, with a further 2.8% of total supply coming from renewable energy sources, mainly wind farms. The government has set a target of sourcing up to 25% of the nation's electricity needs from renewables, using a mix of solar, wind and geothermal by 2020. A 2007 law set parameters for feed-in tariffs on renewables like wind, solar and hydro, as well as for off-grid systems. The exact rate, however, is fixed by power purchase agreements (PPA) negotiated with the Energy Regulatory Commission. On top of issues with generation and distribution, end-users have also faced delays in being connected to the grid. In its "Doing Business 2015" report, the World Bank ranked Mongolia 142nd out of 189 countries in terms of the ease of small businesses procuring electricity. Mongolian businesses have to complete eight procedures before securing power connection, a process that on average takes 79 days, the report said. The ranking for procuring electricity was the second lowest achieved in the survey by Mongolia, and well short of its overall country rating in 72nd place. However, the report noted that Mongolia had implemented some reforms to improving efficiencies last year, including enforcing time limits at different stages of the connection process and improving internal processes. It is hoped that new contracts will go some way to alleviate the shortages. In late January, Mongolia's MAK Energy signed an agreement with China's Harbin Electric International Company for the construction of two 135-MW power stations to be located in the Umnugovi Aimag region. The plants will provide power for the nearby Narin Sukhait coal mine and act as a back-up source for other large mines in the area such as Oyu Tolgoi. Rapid urbanisation, in particular in and around the capital, has also seen energy demand swell. Central to government efforts to close the energy gap is the delayed 25-year build-operate-transfer concession for CHP5, a coal-fired plant in Ulaanbaatar, which will produce 415 MW of power and 587 MW of steam. The $1.2bn project is to be developed by a consortium including France's GDF Suez, South Korea's Posco Energy, Japan-based Sojitz and Mongolian firm Newcom. A 25-year PPA was signed with the government in 2014. March 30 (news.mn) Head of the Cabinet Secretariat S.Bayartsogt gave tasks to the management of ministries and agencies and introduced information regarding the present economic conditions of Mongolia during the online meeting "Responsibility, Inspection and Implementation". As stated by the Head of the Cabinet Secretariat, as of the first two months of this year there progress has been made in the recovery of the economy. He highlighted that the inflation rate has been decreased by 2.7 percent in comparison with the same period of last year, and that export reached 753.2 million USD and increased by 26.7 percent. Import was 462.4 million USD in 2014, which means that it has been decreased by 24.7 percent. S.Bayartsogt told the officials, "The decrease of the inflation rate, profitable foreign trade, and seven percent growth in the economy is the results of the work of tax payers. Thus, we are working to create a legal environment to maintain the consumption of national products." During the meeting, the Head of Cabinet Secretariat reminded officials that the management of the ministries should put attention on the organization of programs to address the economic crisis during the short term. Of 27 objectives and 67 measures which are being offered through the program in the first half of the year, the Ministry of Finance and Development Bank of Mongolia will work together on 14 measures; the Ministry of Energy will focus on three; the Mining Ministry, Ministry of Industry and Trade, and State Property Commission will work together on two measures; and the Ministry of Foreign Affairs will take on one measure. S.Bayartsogt noted no terms for the implementation of these measures. For projects dedicated to minimize spending from the state budget, it was decided that measures which have been implemented by the State Property Commission should be maintained by ministries and agencies. Forty vehicles have been taken from ministries and agencies following a decision by the State Property Commission to end the use of all vehicles that consume more than 16 liters of petroleum per 100 kilometers. March 30 (gogo.mn) Statistics show that the number of the new housings is increasing, but as the economy is down there is not much demand for the housing. For residents the main drawback for applying for the mortgage loans is the lack of the 30 percent deposit readily on their hands. While for the construction companies they face difficulty on selling the housing bearing the losses. Lately the initiative on reducing of the 30 percent deposit is being discussed by the Ministry of the Construction and Urban Development and the Deputy Minister G.Baigalmaa is giving us some insights on this matter. -Initiative to reduce the deposit amount for the 8 percent mortgage loan is being discussed at the moment, more on this? -With the start of the mortgage loan program residents with the 30 percent deposit available at their hands, have already been included in the program. Now we are revising the mortgage loan program to involve residents with less possibilities and reduce the requirement of 30 percent deposit. Initially the mortgage program was being discussed to have the deposit requirement of 10-30 percent, but the Bank of Mongolia after the negotiations with the commercial banks has come up with the strict 30 percent of deposit requirement. Therefore, there is possibility to reduce the deposit amount to 10-20 percent and the talks are being done at the moment. -Many say that although there is enough supply of the housings demand is lacking on the construction market? -According to the data of last five years 2013 has seen the most growth in the construction sector and 12-13 thousand housings have been commencing every year, while 25 thousand housings have commenced last year alone. Studies show that the economic downturn is the main reason for the lack of the cash on hands of the residents, which in turn drives the demand on housing down. -How many housings are to be commenced this year? -Total of 30 thousand housings are to be ready in 2015, and this number includes the 7000 from the last year. There are many residents to be willing to move into housings in the city as well as in the rural areas. There is possibility to construct 1000 housings in each aimag by 2016. -Infrastructure for those housings needs to be solved. What is the Ministry policy on infrastructure development for the new residential housings? -Past two years the city expansion plan provisioned expansion towards Yarmag, Nisekh and Bayangol hills areas to the west of the city. Therefore the city had expanded its infrastructure towards those areas delivering water supply, energy and sewage and sanitation services. Buyant-Ukhaa sanitation facility capacity has been doubled. Most pressing issue currently is the sewage and sanitation services, therefore we are constructing the additional sanitation facility with the capacity of 20 thousand cubic meters. Infrastructure for the new housing projects is to be solved with local facilities. Technology used currently in the construction sector is delivering advanced techniques and technologies, which enable us to solve the issues with ease and less impact on the environment, such as use of the renewable energy sources. We are aware that the energy and heating supply is the biggest problem nowadays and we are working on the possible solutions. This issue is also to be addressed by the Ministry of Energy. Last year we have started the development of the US 15 power and heating station at the Amgalan, which is to commence this year and allow the expansion at the eastern part of the city. Ulaanbaatar, March 30 (MONTSAME) Members of parliament S.Byambatsogt and D.Khayankhyarvaa, together with D.Tsogtbaatar, the Minister of Construction and Urban Development, and N.Oyundari, the Vice Minister of Foreign Affairs Monday have worked in Selenge aimag's Shaamar soum. They held meeting with local people to report on present issues and to receive opinions on 32 draft laws to be discussed by the parliamentary session. Shaamar soum has 3,900 population, most of whom are engaged in agriculture and farming. Agriculture is the living source but this business is always out of attention of the government, they said. Moreover, the bee-keepers do not receive any benefits like the herders and farmers do, so they want the MPs to convey their requests to the state. In response, the MPs said they are not sure whether it will be tackled this year, but added they will focus an attention on this matter. March 31 (gogo.mn) According to the reserve meat is being sold today, officials led by State Secretary at the Ministry of Food and Agriculture visited the storages of meat reserve companies. Before, reserve meat was sold from January. As the Government lacked the funds for the remaining subsidies, it was still kept in storage. Government was budgeting subsidies of MNT 1,000 to per kg of reserve meat in order to protect from increase in meat price. However, the Government subsidy was cut from the budget during the budget adjustments in 2015. Meat reserve companies required remaining subsidies worth of MNT 4.5 billion and kept reserve meat in a storage until today. That issue was solved by negotiations between the Ministry of Food and Agriculture, Meat Association and meat reserve companies. State Secretary, Ariunbold said to not worry on the quality of the reserve meat as Special Inspection Agency and National Emergency Management Agency have conducted monitoring over the quality. March 22-25 (US Embassy) Nicholas Kralev, a renowned author, journalist and entrepreneur, visited Mongolia on March 22-25, 2015. During his visit, he discussed journalism and diplomacy with groups including Ministry of Foreign Affairs of Mongolia officials, university students, journalists and members of the general public. After arriving on March 22, he dined with Mongolian Association of State Alumni members who have experience in international relations., On March 23, Mr. Kralev's programming included meeting with U.S. Embassy officers, holding a brown bag lunch, conducting a press and media training with staff members of the U.S., UK, Japanese, and Czech embassies in Mongolia, meeting with administrators and faculty of the National University of Mongolia's (NUM) School of Foreign Service and speaking to students about the impact of American diplomacy in the 21st century. Finally, Mr. Kralev lectured about diplomacy at the American corner in Ulaanbaatar. On March 24, Mr. Kralev met with administrators of the Graduate School of the University of Humanities' School of Foreign Service and delivered a talk about the impact of American diplomacy in the 21st Century." Later that day, he met with administrators, faculty and students from NUM and the University of Humanities; his talk focused on journalism, government and public policy. On March 25, Mr. Kralev visited the NUM Business Consulting Center and delivered a lecture to a group of business professionals and students titled "Know Thyself: Rethinking Corporate Identity, Values and Soul." Additionally, he lectured about media responsibility in public policy at the Press Institute of Mongolia. Mr. Kralev concluded his visit by meeting with Ambassador Bekhbat Khasbazar and Ambassador Enkhsaikhan Jargalsaikhan to discuss diplomatic academy training at the Ministry of Foreign Affairs (MFA), and spoke about the challenges of diplomatic practice and training to an audience of MFA officials and diplomats-in-training, as well as people from the Institute of International Studies of Mongolia, the Institute of International Studies of Mongolian Academy of Sciences, the Institute for Strategic Studies, the Mongolian National University, the School of International Relations and Public Administration. March 22 -- Direct Democracy: Changes and Challenges captures Mongolia's direct democracy practices and experiences. Directed by internationally awarded film director S.Byamba, the film focused on the introduction of decentralisation and citizen participation in decision-making. April 1 (Asian Investor) Frontier countries have set out their stalls in the race to attract foreign capital, with very different approaches on display. From nascent stock market development to poverty reduction goals, some of the poorest countries in Asia have made clear what their priorities are and where foreign funding and expertise is most particularly needed. Representatives of Cambodia, Myanmar, Mongolia and Bangladesh made their business development pitches at the Credit Suisse Asian Investment Conference in Hong Kong last week. Serge Pun, chairman of Myanmar conglomerate Yoma Strategic Holdings, said most frontier markets in Asia were competing to attract overseas investors, especially to provide infrastructure financing. The result was that their foreign direct investment (FDI) rules were all quite similar, with substantial tax incentives for overseas investors. Most of them have ambitious growth targets too, and this could cause destabilising income and social inequalities later, he said. Myanmar's stock market is expected to open later this year. Thiri Thant Mon, head of corporate development for Yoma, said an announcement is planned for July and that once the market opening is confirmed, First Investments, a Yoma affiliate company, will be the first company to list. She said nine foreign banking licences have been issued so far in Myanmar, including three Japanese banks, Singapore's UOB and ANZ from Australia. For its part, Bangladesh has the ambitious aim of reducing poverty from 35% to 15% of its population and achieving middle-income status by 2021. "The private sector is the engine for growth and the country is keen to attract foreign investment into 32 key areas including ready-made garments, textiles, pharmaceuticals, IT and agriculture," said Syed Abdus Samad, chairman of Bangladesh's Board of Investment. Cambodia also has ambitious plans to raise the standard of living, and attain high-income status by 2050. The country's economy is growing at more than 7% a year, driven by agriculture, garments and textiles. "Cambodia is a very business-friendly country with almost every sector open to overseas investment," said Sun Chanthol, senior minister of commerce. For instance, 28 out of 36 banks are foreign-owned. Sun highlighted Cambodia's political stability, solid macroeconomic ratios and its government's determination to develop the country's physical infrastructure. "We need to rebrand Cambodia from the image created by the movie The Killing Fields," he said. The frontier markets session was enlivened by the youthful exuberance of the Mongolian representative dropping an F-bomb while trying to make a competitive case for his country's land-locked position between two economic giants. Stepping in for the head of the investment department, who he said had a sore throat after sampling Hong Kong's nightlife, 25 year-old Tuvshinbileg Ganzorigt, head of the funding division for the Development Bank of Mongolia, made the audience laugh with his candid comments, explaining he was more used to addressing an online blogging audience than a room full of financial market professionals. Mongolia is strategically placed between Russia and China, and is blessed with vast mining resources, he said. "Last year we enacted a new investment law that removes the distinction between foreign and domestic investors. We have also extended exploration licences and land permits," he said. As frontier countries increasingly target FDI and offer similar financial incentives, they might need to advertise other attractions. Ganzorigt suggested Mongolia (population: 3 million) has appeal in having the highest number of horses per capita: "Our ponies are world-class," he said. But people shouldn't doubt Mongolia's ambition. Ganzorigt referred to the Mongol warriors having armour only at the front, "so if you turn your back, you're dead meat. That's how aggressive we are," he said. Asked by AsianInvestor about the development of financial markets in these countries, the response was frank. Sun said: "Cambodia opened our stock market in 2012; so far two companies have listed." The first listed company, in 2012, was the Phnom Penh Water Supply Authority. The second was Grand Twins International, a Taiwanese garment maker, which began trading in June 2014. Sun said many of Cambodia's private companies are family-held, "so it will be some time before there will be any real corporate thinking in terms of an IPO market." Ulaanbaatar, March 27 (MONTSAME) On March 26, the Minister of Industry D.Erdenebat participated in the "Minister's hour" meeting to give information on the Ministry's works towards improving the sector's legal environment and boosting the industrialization. He said his Ministry set such priorities as developments of policies and strategies regarding the industrialization, of industry location maps and development zones. In 2014, Mongolia imported products with value of 5.2 billion US dollars, of which 28 percent were fuel, 30 percent—machines and their spare parts and 10 percent—steel wares, while the industrial products covered zero percent in the country's exports, said the Minister and added that economic policies should be developed based on such indications. The Ministry, since its establishment, has determined its fundamental policies and submitted several draft laws to parliament for improving its legal environment, he went on. For instance, thanks to the adoption of the Law on Free Trade Zones, working groups had been set up and the have forwarded the negotiations with the two neighboring countries on the issues concerning borderland trades and tariff alleviations. Draft law on trades is to presented to the cabinet and be considered by parliament later. The concept of the draft law on Small and Medium enterprises has been approved by the cabinet of Ministers, he added. Financing has been allocated of 70 billion MNT for the Fund for Promoting SMEs, said the Minister. He highlighted successful operations of the steel nail factory that was financed by the fund loans. The cabinet resolved to forward establishing crude-oil processing plants in eastern region and the Gobi. A financial proposal for potential investors can be on the table next autumn, now that the pre- feasibility studies and environmental assessments are being undertaken, said the Minister. March 27 (Jargal de Facto) Mr. Deligiannis has worked in the airline industry for over 15 years, 12 focusing specifically on Asia Pacific markets. He has lived in Hong Kong, Beijing, and Ulaanbaatar, Mongolia during this period. Spiro Deligiannis worked with Eznis Airways as a Vice President of Sales & Marketing at Eznis Airways. March 30 (Mongolian Economy) This March, Mongolia participated as the official partner of the International Tourism Boerse-2015 in Berlin, the world's biggest international tourism expo. Nearly 300 representatives of the Mongolian tourism industry gathered in Berlin to promote Mongolia. Many more expat Mongolians who live in Berlin visited the ITB expo to admire their home country's participation. This led the Director of the ITB expo, Christian Goke, to say: "These days, Berlin has become the capital of nomads." Over 10,096 organizations from 186 countries came here to promote themselves and to meet with old and new partners. A total of 16 Mongolian tourism companies went to Berlin to meet and cooperate with business associates; each marveled at how much busier they were than in previous years. The participants shared their thoughts and experiences of the ITB expo with Mongolian Economy magazine. We have participated in ITB expo for five years. We get an average of 14,000 tourists per year. Participant companies, government and non-governmental organisations showed much more energy and devotion compared to the previous years. Also, Mongolia's promotional area's appearance, scenery, concerts and performances were very good. In previous years, much less people were visiting the Asian—especially the Mongolian—promotional area. Generally, we just met with scheduled partners during the ITB expo in the past; but this year, thanks to good advertising, many tourism companies and visitors came to us. Our company was scheduled to hold 50 meetings, but we were so busy that we could only afford to hold 30 of them. From these meetings, we agreed to cooperate with five companies, while the rest is at the negotiation stage for now. We mustn't lose the momentum we gained through the ITB expo, and must continue doing promotional campaigns at least once a quarter, so that we can remind the world about Mongolia. For example, we must hold onto our image and continue our campaign 'Mongolia, Nomadic by Nature'in Germany throughout the next two years. Individually I have participated for 25 years, while this was my 22ndyear as a representative of Tsolmon Travel LLC. There are many tourism exhibitions in the world. But ITB is significant because it's the biggest and the most professional of all of them. The ITB expo gives us an opportunity to meet all our associates and partners at the same time, so that we can exchange experiences and talk about furthering our cooperation. We have foreign partners who we've met for 20 years at the ITB expo. Foreign companies observe companies at the beginning, and then after these companies start to participate in ITB every year, they consider them stable and give offers to work with them. Every companies including our company's objective is to establish relationships with new partners and to strengthen the old relationship. We may not feel the full benefit for participating as an official partner this year, but starting from next year we are going to get real results. We're going to feel the benefit even more the following years. This time, we have met with 17 companies; all of them cooperated with us at least 5-6 years. And we signed contracts with 3-4 companies who were observing us for the last 2-3 years, and starting from next year they're going to create a travel program and send tourists to us. These are the successful results we get from participating in ITB expo every year. Many new companies met and got information about Mongolia from us. Tour companies begin their operation when they become confident after many years of market surveillance. Our company is participating for the 12th year. Participants showed much more energy and devotion compared to the previous years, because this year we're participating as an official partner. We cooperate with more than 100 foreign companies. This year, we have met with nearly 100 new partners, and came to an agreement to cooperate with one foreign company. Some markets, particularly the Russian tourism market, are in a downturn; so Mongolia-Russia-China travel package interest is decreasing, and tourists are becoming more interested in travel around Mongolia. I think the public is more interested in countries that participate in ITB each and every year. And we can feel that people's knowledge about Mongolia is getting better. Especially, people are more interested in active travels such as kayak, hiking and motorcycle tours. We won't get the benefit of participating as an official partner if we participate like the previous years. Both the government and private sector must work actively to materialize the things we got from ITB expo. Our company is participating for the 22ndyear. We host around 8,000 to 10,000 tourists per year. German tourists comprise 30-40 percent of the total tourists coming to Mongolia. Our promotional area and other expo features were all unique; it seems like Mongolia really gave significance to this year's exhibition. Many people came to meet with us. For example, a few years ago we visited Austria and Switzerland to meet with companies, but it was not so successful back then; this year, however, they came to us themselves and talked on contractual levels, so this shows the scope of participating as an official partner. We met with 58 companies and associates during this year's ITB exhibition. Out of those, 21 were old associates and 37 were new companies. This number would be in the hundreds if we count the people who talked and received our promotional materials. Thirty-four percent of our partners and associates are from German speaking countries. We expect the number of tourists will increase after participating in the ITB expo. So Mongolia needs to increase and stabilize the frequency of international/domestic flights and train schedules. For instance, the April flight schedules are still not out. European tourists especially plan and book their travel a year ahead. But we still don't have set schedule and it's really hindering our job. We need to resolve this issue as quickly as possible. From our side, we are doing everything possible to improve our services to meet our partners and tourists wishes. Our company is participating for the fifth year. Our company's objective is to establish a relationship with new partners and to solidify old relationships. We host 500 to 800 tourists per year. We offer more expensive tour packages, because we focus on quality over quantity. Although our company gets more tourists from English speaking countries, we participate in the ITB expo in order to get trips from German speaking countries. Whenever we come here, we discuss collaboration with usually 3 or 4 companies. This year we met with 10 old accomplices and 20 new partners. We have several agreements that reached contractual levels of discussion. Our old partners were very grateful for Mongolia's participation as an official partner, and they were expressing that their confidence in us has increased. As for new partners, they were coming to meet us after hearing that we're participating as an official partner. Peoples' interest in us was ten times that of previous years. In the past, our promotional area was almost empty on the final two days of the exhibition. You can't expect results just after participating for the first time; you need to participate at least 2 to 3 times to get the attention of big tourism companies. Foreign companies put a big priority on a company's stable operation. Our new and old partners were saying that the most difficult issue is that it's very hard to make a flight to Mongolia. They say that the tickets are expensive and mostly not available. It's a priority to increase the frequency and destination of the flights. In order to increase the flow of tourists, the number of flights must be increased. 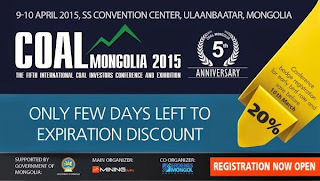 March 30 (infomongolia.com) Mongolia Mining 2015 International Mining & Oil Expo will be held for the 5th consecutive year at Buyant-Ukhaa Sports Complex in Ulaanbaatar on April 01-03, 2015. The 5th edition of the expo will feature traditional mining and emerging oil industries of Mongolia with exhibitors and visitors representing the industry's major companies and the largest number of professionals. In addition, the organizing committee will hold seminars with guest speakers from the Government and its agencies, academic scholars, business professionals covering topics including the Government policy on mineral resource and adapted new laws, mega projects of Mongolia, the trend and forecast of the industry, and more. The expo is organized jointly by Minex Mongolia Co., Ltd, Erdenes Mongol LLC, Expo Mongolia Co., Ltd., and International Expo Bureau of Mongolia. As a tradition and the most important technological event of the country, the Ministry of Mining, Mongolian National Chamber of Commerce and Industry, Mineral Resource Authority are serving as the main supporters of Mongolia Mining 2015. Moreover, Mongolia Mining will host exhibitor booths from mining and exploration companies, oil exploration companies, service providers and equipment suppliers, evaluation and consulting companies, investment and financing institutions as well as representatives of multilateral organizations interested in this crucial industry. March 31 (GoGo Mongolia) Government of Mongolia Program includes the construction of the new residential housings at the newly appointed residential areas. Financing of the New Yarmag residential housing project has been discussed and approved by the cabinet yesterday. The housing project is to be located in the 8th khoroo of Khan-Uul district and previously the project has secured the Major Loan Negotiation with the Export-Import Bank of China back in 2012. First phase of the project is to commence in 2015 and the funding needed for the implementation totals to USD 245 million, of which USD 195 million to be financed by the Export-Import Bank of China and the rest 15 percent and loan costs totaling to USD 50 millionaire to be financed with the Mongolian Development Bank resources through the Mongolian Mortgage Corporation. Cabinet sees the foreign long-term and low interest rate loans as the most appropriate financing tools for such housing projects, which aims to resolve the social infrastructure at the same time. First phase of the New Yarmag project provisions the construction of the housing with total of 386 thousand sq.m, vocational training center, secondary school and kindergarten buildings. Ulaanbaatar, March 27 (MONTSAME) The Council of Ulaanbaatar Administration discussed the guidelines for launching waste-management improvement frameworks on March 27. The first objective of the frameworks is a capacity building of the waste-transporting companies and expanding their services scope. Public inspectors, selected from the citizens, will be appointed by the Mayor's direction. They will be responsible for documenting the cases of violations concerning waste management and report the cases to governor of a khoroo or to a professional specialized inspector, to have the offenders fined with suitable charges. The council also intends to announce a prized bid among waste handling companies for projects and initiatives on improving waste management. The UB administrators consider that these works will reduce littering in streets, improve citizen's participation and help in establishing safe and healthy environment for the people. Ulaanbaatar, March 27 (MONTSAME) The Mayor of Ulaanbaatar city E.Bat-Uul Thursday received Mr Toomas Lukk, the Concurrent Non-Resident Ambassador of Estonia to Mongolia, to share views on the Mongolia-Estonia cooperation. The Mayor said Estonia, which can offer many things to study, has gained big achievements in developing democracy. He expressed a willingness to Ulaanbaatar city to establish a cooperation contract with Tallinn, and added that he wants to visit Tallinn. In response, Mr Toomas thankfully accepted the proposal of the Mayor and said he will convey it to the administration of Tallinn city. March 30 (UB Post) The Vice Minister of Foreign Affairs of the Republic of Korea Cho Tae-yul is paying a visit to Mongolia. On Thursday, the visiting delegation were familiarized with the halls of the parliamentary session and standing committees, and the Government Palace's media chamber, fully equipped with digital technology through the "e-Parliament" project supported by South Korea. B.Boldbaatar, the secretary general of the Office of Parliament, introduced the delegation to work carried out in the scope of the project, which was implemented by Parliament through 3.5 million USD in non-refundable aid from the government of the Republic of Korea. The project was carried out in accordance with an agreement established between the parliamentary office, the Ministry of Economic Development, and the Korea International Cooperation Agency (KOICA). The Secretary General pointed out that polling apparatus and microphone system of the halls were upgraded with LED displays, and video recording machines and rooms for journalists covering Parliament were upgraded. On the same day Vice Speaker of Parliament M.Enkhbold received the visiting delegation. Underlining the importance of this visit in expanding bilateral relations and cooperation between the two countries, Vice Minister Cho thanked the Vice Speaker for the warm welcome. In response, M.Enkhbold said he was happy about the first meeting of the Mongolia-South Korea joint committee and expressed satisfaction with the development of bilateral relations at the level of comprehensive partnership in all spheres. He emphasized that some of South Korea's biggest companies are participating in great construction projects in Mongolia. On the importance of Korean companies working on these projects as investors rather than performers, he added, "this way it will be beneficial for both sides and will contribute to the complementary ties." He also noted that Mongolia's government is undertaking special steps to form conditions that are favorable for investors. The Vice Speaker said that the flag carrying airlines of the two countries, MIAT and Korean Airlines, are operating regular flights between Ulaanbaatar and Seoul, and forwarded a proposal to launch an Ulaanbaatar-Beijing-Jeju flight in order to boost tourism. He also pointed out that official assistance from South Korea has contributed to Mongolia's development and emphasized some of the current goals of the Mongolian government, such as the realization of concrete production and beneficial projects in the spheres of infrastructure, mining, the environment, health and urban development, and the protection of Mongolians living and working in South Korea. The Vice Minister asked the Korean side to support the improvement of their living conditions, reported Mongolian National News Agency. March 29 (The Korea Times) Korean and Mongolian officials met in Ulan Bator on March 26 to discuss ways to upgrade bilateral relations on the occasion of the 25th anniversary of the establishment of diplomatic relations. This is the first time that the two sides had a joint committee meeting where officials from several cabinet ministries met to discuss issues of mutual interest. Vice Foreign Minister Cho Tae-yeol led the Korean delegation and was joined by the Mongolian Transport Minister Namkhai Tumurkhuu. The two sides agreed to diversify bilateral relations on political, economic, social and cultural affairs. Before this, bilateral relations were focused on economic cooperation, trade and labor migration. Mongolia is one of the countries that has sent workers to Korea and many of these workers have helped ease labor shortages in the manufacturing sector. Officials of the two countries discussed ways to improve air quality, prevent the desertification of Mongolia and tackle other environmental problems. The Korean government sees Mongolia as a close partner that can help President Park Geun-hye's vision for a peaceful East Asia and the so-called Eurasia Initiative. Mongolia, meanwhile, seeks to attract more Korean investment for infrastructure and natural resources projects. Ulaanbaatar, March 31 (MONTSAME) In regard of the Ambassador of the Republic of Korea to Mongolia Lee Te Ro's return home, the President received him on March 31. The President said that during the three-year diplomatic mission of Mr Lee Te Ro in Mongolia, a development of the relations has found stability, and that the two sides considered works of the last 25 years of diplomatic relations and discussed frameworks for the next quarter of century. The Ambassador congratulated the President on Mongolia's being selected the host of the next ASEM Summit, and emphasized that Mongolia's role in international relations and its prestige in global arena have been constantly rising, "a fact that Mongolia has been chosen the host country for the Asia-Europe Meeting Summit-2016 manifests the upgraded status of Mongolia's foreign activities". The Ambassador also thanked the President for presenting initiative "North-East Asia Dialogue" and focusing on the regional peace and security. He went on that the President of South Korea made similar initiative concerning the region's peace and security. He suggested that the two countries cooperate in improving the efficiency of these parallel initiatives. After this, Mr Lee Te Ro said the S.Korean government is focusing on increasing investment in Mongolia. "The bilateral relations are expanding in education, health and agriculture," he noted. In response, Mr Elbegdorj thanked him for certain achievements in the relations between our countries and for constant high level interactions during his office. The President appreciates a consistent development of relations in the 25 years of diplomatic relations, he said and noted that he exchanges views with his S.Korean counterpart Park Geun Hye at international events. The President wished Mr Lee Te Ro a good health, happiness and a success. March 31 (news.mn) An event dedicated to the 25th anniversary of the establishment of diplomatic relations between Mongolia and South Korea was held yesterday at the Strategy Research Institute, and a ceremony celebrating the publication of the book "Reunion of the Two Koreas" by B.Lkhagva of the Strategy Research Institute was held. Former President of Mongolia P.Ochirbat, MP R.Gonchigdorj, Ambassador Extraordinary and Plenipotentiary of the Republic of Korea to MongoliaLee Tae-ro, and other officials attended the event. "Reunion of the Two Koreas" was written based on the long term research of the author. The book is said to contain exclusive material regarding the war between North and South Korea. Why some countries around the world become divided and the significance of reunification are clearly explained in the book. March 31 (news.mn) China will deliver a proposal on a general plan for economic cooperation between Mongolia and China within the next month. The proposal will be studied by the Mongolian side before a final agreement is made. As reported by the Trade Ministry of China, the sides are planning to organize a joint meeting next month. During his visit to Mongolia last year, President of the People's Republic of China Xi Jinping said that the sides should reach a decision regarding the establishment of a free trade zone and increase trade between the two countries. Presently, 70 percent of the total trade turnover of the two countries crosses the border at the Zamyn Uud and Erlian ports. March 30 (Want China Times) Facing rapid economic decline, northeastern China is in bad need of a new round of opening up to inject fresh momentum into its economy, the Guangzhou-based 21st Century Business Herald reports. To that end, an opportunity that the region cannot miss is the "Belt and Road" initiative, referring to the Silk Road Economic Belt and the 21st Maritime Silk Road proposed by President Xi Jinping in September 2013. In September the following year, Xi further proposed building an economic corridor linking China, Mongolia and Russia by connecting the Silk Road Economic Belt to Russia's transcontinental rail plan and Mongolia's Prairie Road program. Chen Yongchang, chief of the Heilongjiang provincial government's technology and economics advisory committee, told the daily that the China-Mongolia-Russia economic corridor has two channels. The first channel will link Beijing, Tianjin and major cities in Hebei province with Hohhot in Inner Mongolia, and will then extend to Mongolia and Russia, Chen said. The second channel will run along the eastern China railway, connecting Dalian, Shenyang, Changchun and Harbin with Manzhouli in Inner Mongolia and Chita in Russia, he said. More importantly, the corridor will provide a link between the Liaoning Coastal Economic Zone, the Changchun-Jilin-Tumen Pilot Zone in Jinlin province and the Harbin-Daqing-Qiqihar Industry Corridor in Heilongjiang province, which are the most economically active areas in northeastern China, the daily said. Liu Shuming, a research fellow with the Jilin Provincial Development Research Center, said the China-Mongolia-Russia economic corridor will not only become a branch of the "Belt and Road" system but can also connect with the Chinese government's strategy of promoting the collaborative development of Beijing, Tianjin and Hebei. Ulaanbaatar, March 30 (MONTSAME) A delegation led by Mr Wang Xiaolong, the Ambassador Extraordinary and Plenipotentiary of the People's Republic of China (PRC) to Mongolia, toured Arkhangai aimag March 28-29. The Ambassador started his visit by opening a photo exhibition named "Memoire of Mongolia-China trade and economic cooperation" organized at the #1 school in Erdenebulgan soum. This exhibition attracted authorities of the province including Mr D.Bat-Erdene, its governor. This aimag has friendship and cooperation protocol with China's Yunnan province and Inner Mongolian Autonomous Region in accordance with the two governments' permissions and brotherhood friendly ties with Chinese Inner Mongolian Ulaanhot. Arkhangai is also the very first Mongolian province to hold cultural days of Chinese Inner Mongolia and to send its artists to perform in Ulaanhot. The aimag's external relations have been contributing to culture, education and health spheres. This aimag has a kindergarten named after Mongolia-China friendship, a new one will be erected in a 7th baga (smallest administrative unit in a locality) with a non-refundable aid of China. MINSK, 31 March (BelTA) – Belarus and Mongolia will step up efforts to promote trade and economic ties in the context of Belarus' membership in the Eurasian Economic Union (EEU), BelTA learned from the press service of the Belarusian Ministry of Foreign Affairs. These issues were top on the agenda of the meeting between Ambassador of Belarus to Mongolia Stanislav Chepurny and Head of the Europe and America Department of the Ministry of Foreign Affairs of Mongolia Bartlai Chuluunkhuu. The sides discussed the state of affairs and prospects of relations between Belarus and Mongolia, the exchange of visits, expansion of the legal framework of bilateral cooperation. Special attention was drawn to the preparation and holding of the Belarus-Mongolia ministerial consultations. Ulaanbaatar, March 31 (MONTSAME) The Minister of Health and Sport G.Shiilegdamba Tuesday received Mr K.I.Koblandin, the Ambassador Extraordinary and Plenipotentiary of Kazakhstan to Mongolia. The Minister noted that it is their first meeting since he had been appointed the Minister, and hoped that the Ambassador will offer specific proposals to cooperation in health and sport fields. In response, Mr Koblandin expressed a willingness to cooperate with Mongolia in many directions within the health sector. He added that specific works will be done in the health in accordance with decisions made at the Mongolia-Kazakhstan intergovernmental commission meeting last year. Their embassy is organizing a work to involve medical doctors of the two countries in experience sharing training, he said. Although our countries have established 45 cooperation documents, there is no agreement on collaborating in the health sphere, so "we want to formulate a document," Mr Koblandin added. Mentioning that Kazakhstan decided to compete in a bid for hosting the 2022 Winter Olympic Games and is planning to host the 2017 Winter Universiade, Mr Koblandin asked the Mongolian side to take part in these events. The Minister received the health sector collaboration proposal and said Mongolia will focus on widening the traditional cooperation in sports. Ulaanbaatar, March 30 (MONTSAME) The State Secretary of the Defense Ministry Major-General Z.Boldbaatar has met Major-General Greg Bilton, Deputy Commanding General of Operations for U.S. Army Pacific, the Defense Ministry's website published last Friday. The sides discussed the Mongolia-US ties in the defense field, especially the friendly and effective cooperation between the Armed Forces of Mongolia and of the United States Pacific Command, and exchanged views on prospects of the collaboration. Mr Bilton expressed a gratitude to the Mongolian Armed Forces for participating in the International Security Assistance Force (ISAF) in Afghanistan, and appreciated an expansion of the "Khaan Quest" international military field exercises for peacekeeping operations. He said the U.S. Command in Pacific will make efforts to deepen the bilateral cooperation. March 27 (infomongolia.com) The fourth Disaster Response Exercise and Exchange under "Gobi Wolf 2015" has been organized by Mongolian National Emergency Management Agency (NEMA) and the U.S. Government in Ulaanbaatar on March 24-27, 2015. The Gobi Wolf 2015, a bilateral disaster response exercise is designed to increase emergency response and management in Mongolia started with an opening ceremony held at the Chinggis Khaan Hotel, where the NEMA Chairman, Brigadier General T.Badral; the Deputy Commander of U.S. Army, Pacific Major General Gregory Bilton; the Deputy Chief of U.S. Mission to Mongolia Kirk McBride, and the NEMA Disaster Preparedness Department Director, Colonel B.Uuganbayar opened the session. The Gobi Wolf 2015 exercise consists of a multiple-level reaction to a hypothetical critical event. The Disaster Response Exercise and Exchange is primarily between the U.S. Government and the National Emergency Management Agency, which enlisted the Chinggis Khaan Airport and a local hospital to take part in the exercise. The exercise, focused on improving the coordinated response to an occurrence of an earthquake in Ulaanbaatar region, includes the planning and organization of the several agencies of the Government of Mongolia, as well as its coordination of expected international assistance. There are three phases. First, a "table-top" exercise will facilitate recognition of adversity and difficulty in performing an agency's assigned tasks while dealing with the physical consequences of an earthquake. Second, a two-part field training exercise will replicate, at a small level, the demands of a disaster response situation at the airport and at the selected hospital. Finally, a day of actions analysis and recommendations for improved agency cooperation will be concluded with an After Action Review. Participants in this year's Gobi Wolf Exercise include the National Emergency Management Agency; United States Agencies such as the Federal Emergency Management Agency, U.S. Army Pacific, U.S. Agency for International Development (USAID), and the U.S. Army Corps of Engineers; and international agencies including the World Food Program, the International Civil Aviation Organization (ICAO), and the United Nations' International Children's Emergency Fund (UNICEF). March 31 (infomongolia.com) On March 26-29, 2015, Mongolian military delegation led by Chief of the General Staff of Mongolian Armed Forces, Lieutenant General Ts.Byambajav took part in the First United Nations Chiefs of Defense Conference held in the UN Headquarters in New York, USA. The international forum brought together representatives of more than 100 Member States to discuss issues central to UN Peacekeeping as part of a wider process of engagement by the UN with Member States to expand the peacekeeping partnership and promote effective and efficient implementation of mandates. On March 27, Secretary-General Ban Ki-moon delivered an opening remark to the gathered Chiefs of Defense Conference appealing to senior military officials for more troop contributions from States around the world and for political will and purpose. Moreover, the Under-Secretary-General for Peacekeeping Operations, Herve Ladsous, Under-Secretary-General for Field Support, Atul Khare and Military Adviser for Peacekeeping Operations, Lieutenant General Maqsood Ahmed made presentations on the challenging issues face today. During the event, Lieutenant General Ts.Byambajav held separate meetings with Under-Secretary-General for Peacekeeping Operations, Herve Ladsous and Under-Secretary-General for Field Support, Atul Khare as well as Defense Minister of Kyrgyzstan, Abibilla Kudaiberdiev; Deputy Chief of General Staff, People's Liberation Army of the People's Republic of China, Admiral Sun Jianguo, Deputy Chairman of the Joint Chiefs of Staff of Republic of Korea, Lieutenant General Kim Yoo-geun and Head of Management and Planning Department at General Staff of the Republic of Turkey, Major General Baki Kavun to exchange views on military cooperation with the present situation and future prospects, as well as to seek possibilities on increasing the capacity of mutual efforts on bilateral and international training and preparation process. March 31 (news.mn) The 19th conference of the Energy Sector Coordinating Committee is being hosted in Ulaanbaatar by the Ministry of Energy, Asian Development Bank, and the World Bank. The Ministry of Energy, representatives from energy agencies, representatives of the governments of the 10 countries participating in a Central Asian regional economic partnership program, and representatives of seven international organizations are participating in the conference. The Central Asian regional economic cooperation program which has been actively carried out over the last 10 years to ensure economic growth, the reduction of poverty, and the development of cooperation between six multifunction organizations and 10 member countries of Central Asia. The attending specialists at the conference are discussing, in detail, the main four sectors of the economic cooperation program, the transportation sector, and the alleviation of issues of trade, trade policy and strategy to be adhered to through 2020. Energy sector representatives are mostly putting their attention on the maintenance of the trading of energy by establishing an energy network system and developing cooperation between regional countries. Within this framework, almost 33 projects at a total cost of 4.2 billion USD have been dedicated to maintaining regional energy trade issues, and the creation of a regional network has been implemented over the last 10 years. At this meeting, the outcomes of activities implemented from 2013-2015 will be reviewed, and conference attendees will discuss the plan of operations to be implemented in 2020. Ulaanbaatar, March 30 (MONTSAME) A chairman of the National Commission on Human Rights J.Byambadorj presented Monday a 14th National Report on the status of human rights and freedom in Mongolia to the Speaker of parliament Z.Enkhbold. The Human Rights reports are the documents that aim at making policy changes in order to draw attentions of parliament, government and government bodies to the pressing issues concerning human rights, to eliminate human rights' violations, and to improve the implementation of those rights and freedoms. The latest report outlines initiatives regarding the right not to be tortured or be treated inhumanly, the rights of the human rights protectors, human rights education, comprehensive nursing homes, pawnshop operations and the right to property, and the rights of the police officers to labor. Mr Byambadorj said the report has been based on the auditory and research results that had been run by state and non-governmental organizations and the National Commission on Human Rights, and on the petitions and complaints addressed for the Commission, "it also includes information on the current situation in Mongolia of human rights and freedoms". The report is to be presented to the Office of the High Commissioner of Human Rights, the International Coordinating Committee of National Human Rights Institutions, and to other similar national institutions in Asia-Pacific. Present were also member of the National Commission on Human Rights N.Ganbayar and P.Oyunchimeg. March 30 (gogo.mn) Yesterday, the youngest World Wrestling Champion, S.Tserenchimed received her championship belt. S.Tserenchimed advanced to 63kg category and wrestled at "Mongolian open-2015" for bronze medal. Unfortunately, she lost and did tactical mistake at the last second of wrestling against Monica Michalik /Poland/. Before the medal awarding ceremony, the President of Mongolian Freestyle Wrestling Association, D.Dagvadorj awarded World Wrestling Championship Belt to S.Tserenchimed. S.Tserenchimed said: "I wondered that I did not receive the belt, after I won at World Wrestling Championship in Tashkent. I am very excited that I received the championship belt, today." World Wrestling Association sent the championship belt to Mongolian Freestyle Wrestling Association. S.Tserenchimed won over Azerbaijan wrestler Ratkevich with 12:3 points at the finals and was awarded gold medal at the World Wrestling Championship hosted in Tashkent. March 30 (UB Post) The fifth Mongolia Open 2015 international freestyle wrestling tournament launched in Ulaanbaatar on Saturday. The tournament features 151 wrestlers from 12 nations, including from Russia, China, South Korea, Japan, the USA, France, Brazil and Mongolia. The wrestlers will compete in eight weight divisions in men's and women's tournaments at Buyant Ukhaa Sports Palace. The Mongolian women's team consist of S.Battsetseg, G.Mandakhnaran, T.Munkhtuya, N.Nyam-Ochir, O.Nasanburmaa, S.Tserenchimed, B.Odonchimeg, D.Otgontsetseg and E.Sumiya. The men's team includes B.Nomin, B.Nyamgerel, J.Chuluunbat, B.Batmagnai and B.Shoovdor. World famous freestyle wrestlers are participating in the Mongolia Open 2015. Among them are silver medalist of 2004 Summer Olympics Guzel Manyurova, Olympics bronze medalist Clarrisa Chun, and Elena Pirozhkova, who won the gold medal at the Pan American games in 2008, 2009 and 2010. Delegates of the United World Wrestling and Russia referee Andrey Krikov has arrived in Ulaanbaatar to referee the event. Krikov acknowledged that Mongolian wrestlers have already claimed their stance in the international wrestling arena. "This is my first time in Mongolia. My first impression was very pleasant," he said at the opening of the tournament. Krikov has been working as a referee since 1997. He has refereed the Summer Olympics 2008 and 2012. Andrey Krikov received the prestigious FILA Golden Whistle Award at 2010 World Wrestling Championships in Moscow, Russia. The first day of the Mongolia Open 2015 saw challenges between freestyle wrestlers of six weight divisions. Mongolian wrestlers had a breakthrough on Day 1 and seized four out of six gold medals in the six weight divisions. State Honored Athlete of Mongolia G.Mandakhnaran set a record by winning his fourth gold medal at the Mongolia Open tournaments. Other gold medalists included State Honored Athlete T.Munkhtuya, International Masters of Sport D.Gombodorj and P.Orkhon. All three are defending champions of the Mongolia Open. March 31 (The Straits Times) The Singapore Under-22s completed their 2016 Asian Football Confederation Under-23 Championship qualifiers without a win on Tuesday, after a 2-2 draw with the Mongolia U-22s at the National Sports Complex Stadium in Vientiane, Laos. Mongolia opened the scoring in the eighth minute when midfielder Mungunshagai Tsogtbaatar turned a loose ball into the net, but Singapore drew level in the 19th minute after Irfan Fandi headed in from a corner. Just as the first half drew to a conclusion, Mongolia regained the lead against the run of play, with Purevdorj Erdenebat receiving the ball at the far post before firing past goalkeeper Rudy Khairullah. Irfan doubled his tally in the 58th minute, latching onto a free kick and sliding the ball into the goal, saving the Cubs' blushes. Munkhtuya lkhamsuren's friends often joke that she'll be Mongolia's next prime minister. For her, it's a joke she intends to turn into a reality. March 31 (ABC Newcastle) It doesn't take long after meeting Munkhtuya Lkhamsuren (known as Tuya) to discover she has a driving-passion to reach the goals she sets herself. The 31-year-old student from Mongolia arrived in Newcastle in January 2015 to study human resource management and business administration at the city's university. Tuya comes from a large family, with five sisters and one brother. She's worked as a radio journalist, but has developed a rampant passion for politics in her homeland... a passion she hopes will one day lead her to the office of prime minister. "That's my dream. This is a serious business for me," she says. "After my graduation, I started working in the [left wing] Mongolian Democratic Party, and since that time I've been interested in politics." Tuya's political interests lie in the education, cultural and science sectors. She's has set herself a timeframe to achieve her goal of governing Mongolia... ten years. Tuya came to Newcastle after finding out about the double master's degree offered at the city's university. She had heard of Australia's major capitals, but wasn't aware of Newcastle. Her husband, a newsagent, is still in Mongolia as she studies for the next two years. "In Mongolia I live in a city, [it's] too crowded and big, so I need a smaller city," she says. "Newcastle is a nice city to study in." Munkhtuya lkhamsuren spoke to 1233 ABC Newcastle Mornings presenter, Jill Emberson.